Writing can be a form of meditation. Writing your thoughts, feelings, and ideas is a powerful way to get to know yourself and find – or develop – your writer’s voice. Meditation offers clarity, insight and a sense of peace. It can ground you in the present moment, a valuable tool for reducing stress and connecting you with your truth. In turn, this can inspire more honesty in your writing, resulting in a more authentic, original voice. The practice of observing something with minute attention and then describing it also facilitates writing as a fine art, where each word adds the picture created in the reader’s mind. The class will open with a guided centering followed by 10 minutes of free flowing, uncensored, stream of consciousness writing. Then we will engage in a brief contemplative meditation, where we focus our attention on an object (inspired by literature), and observe it in detail. We will pick up our pens again to write in response to the object or about the experience of our contemplation. The writing in this lunchtime class will not be shared. It is a personal exploration in a supportive environment that combines the benefits of meditation, journaling and prompts, all in 30 minutes! Space is limited. Sign up now to reserve your spot. 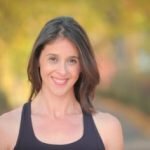 Luisa Tanno is a yoga and meditation teacher who also hosts online creative journaling classes. Since 2003, her focus has been to help clients explore meaningful ways to bring peace, comfort and clarity into their bodies and their daily lives. She has studied many Iyengar-based disciplines of yoga and completed her 200 hour certification with Rolf Gates where much of the work centered on mindfulness meditation. Luisa is also a licensed massage therapist. Personal expression is a lifelong passion of Luisa’s and she has managed to weave it into all aspects of her work. She is the owner of Dance Express, which offers soulful, joyous dance classes for adults. Learn more at Luisatanno.com.